I made cookies for a Salad Bar Potluck at work (I know), but I thought a cookie with fruit fit the theme. Cherry is a fruit. Coconut is a fruit, right? And sugar is a fruit. Okay, I promise I’m not dumb. With my trusty (again not photographed) photo assistant, we began. 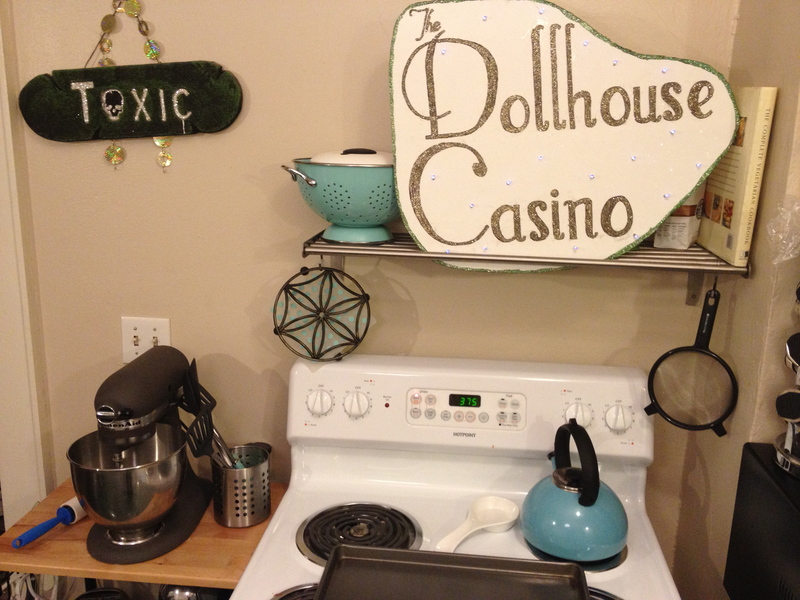 That “Toxic” sign you see is a Halloween decoration that never left. 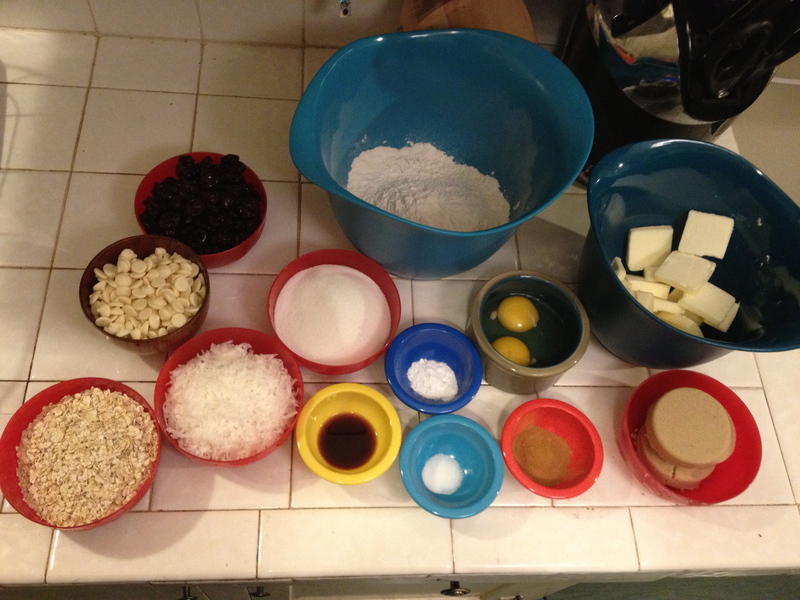 Step 1: Gather ingredients: flour, butter, brown sugar, eggs, cinnamon, salt, baking soda, vanilla, sugar, coconut, quick-cooking oats, white chocolate chips, dried cherries. 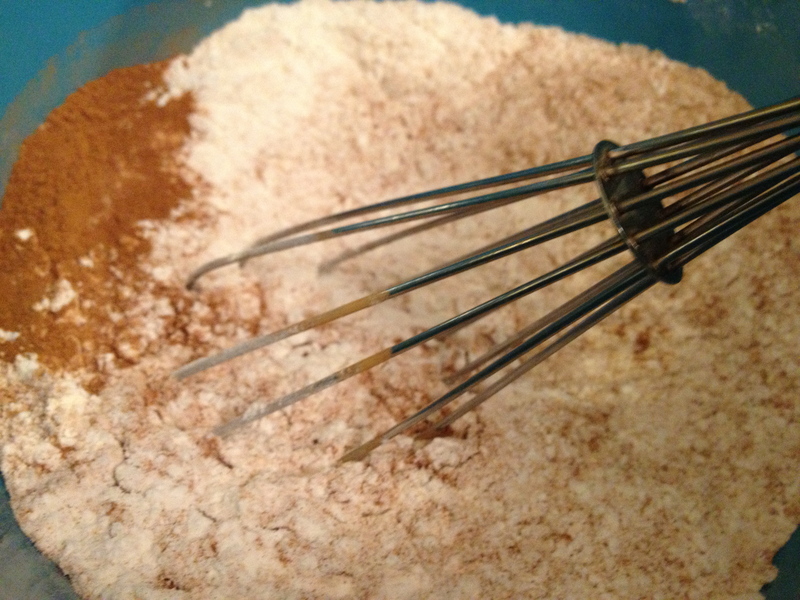 Step 2: Whisk together flour, cinnamon, baking soda, and salt. 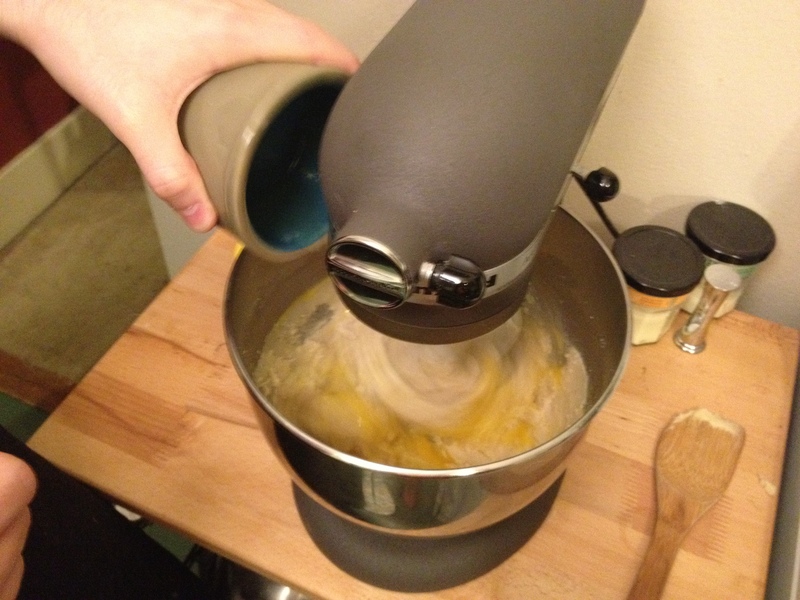 Step 4: Add eggs and vanilla. This is boringly easy so far. 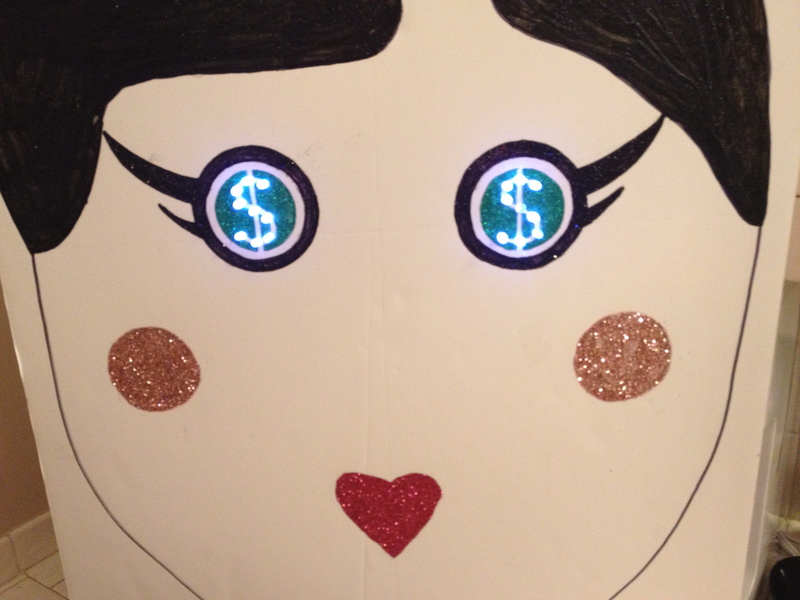 Step 5: Stare into the eyes of the doll mascot from the casino. Her eyes light up. Mesmerizing. Makes me want to gamble. 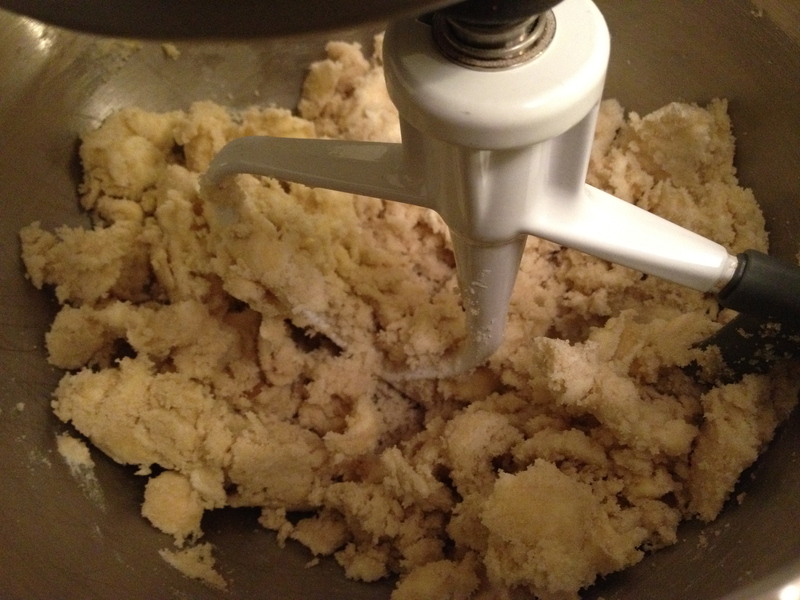 Step 6: Gradually beat in flour mixture until well mixed. 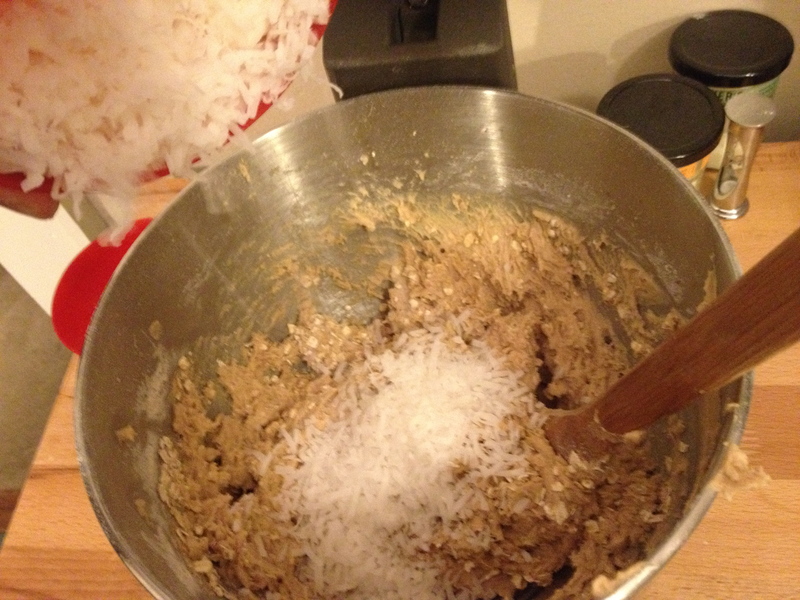 Step 8: Make it snow with coconut. 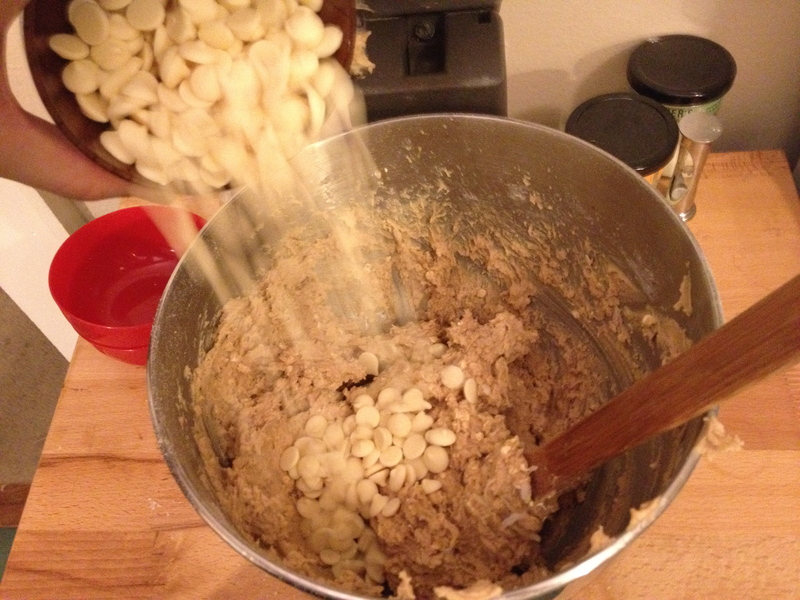 Step 9: Dump in white chocolate chips. 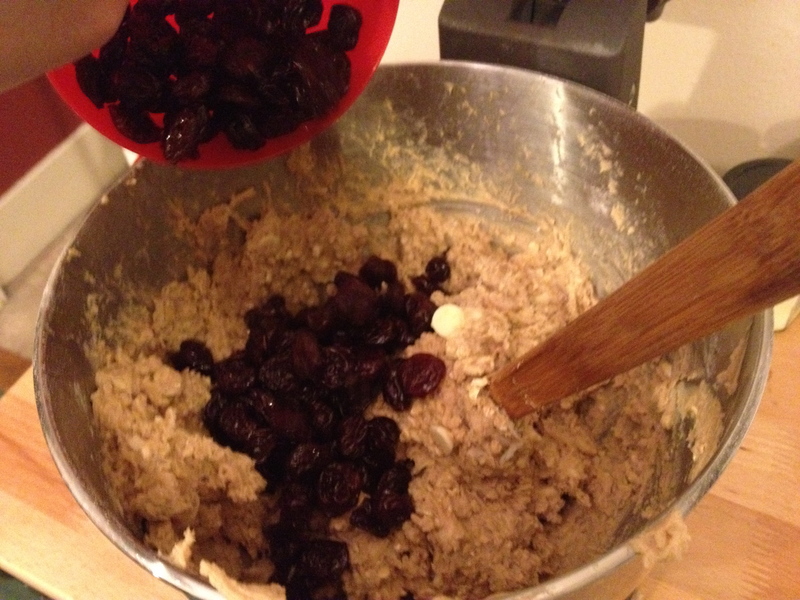 Step 10: Pile on the cherries. Here we have an artsy armpit angle. Usually there’s a cat hanging out on the carpet right there, but they were MIA. 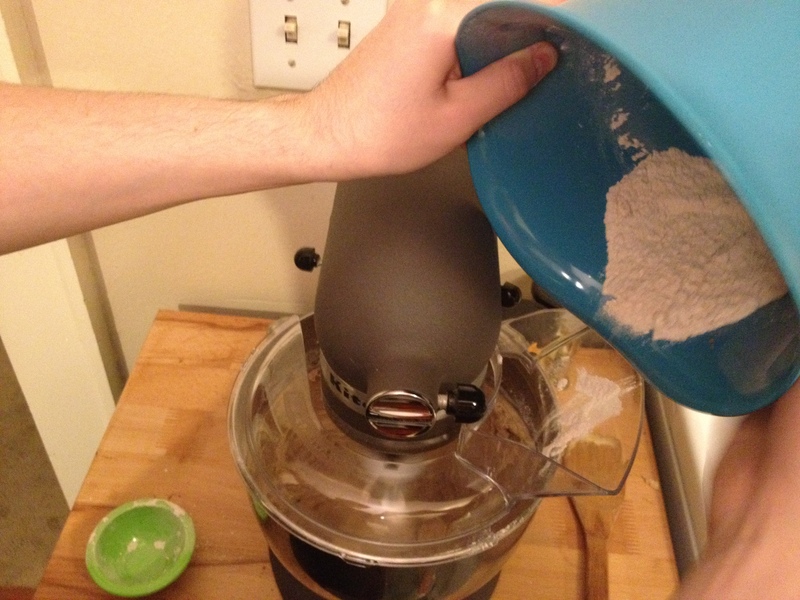 Step 12: Under the trance of the casino doll, eat dough. 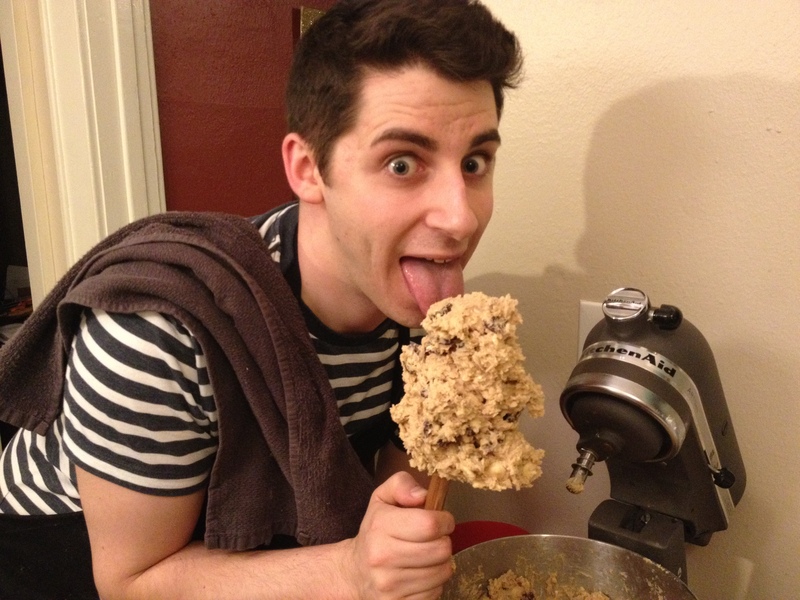 I don’t ever eat dough. It’s bad for morale. 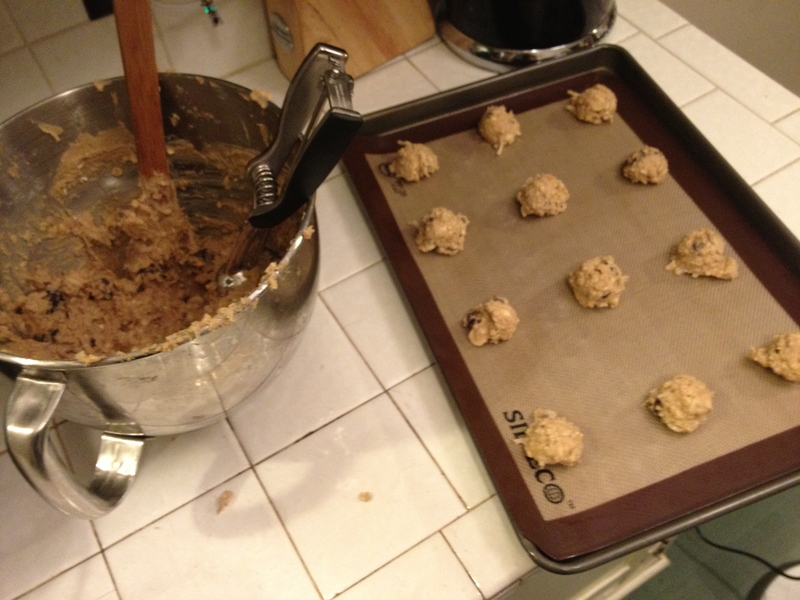 Step 13: Drop dough by rounded tablespoons onto baking sheets. 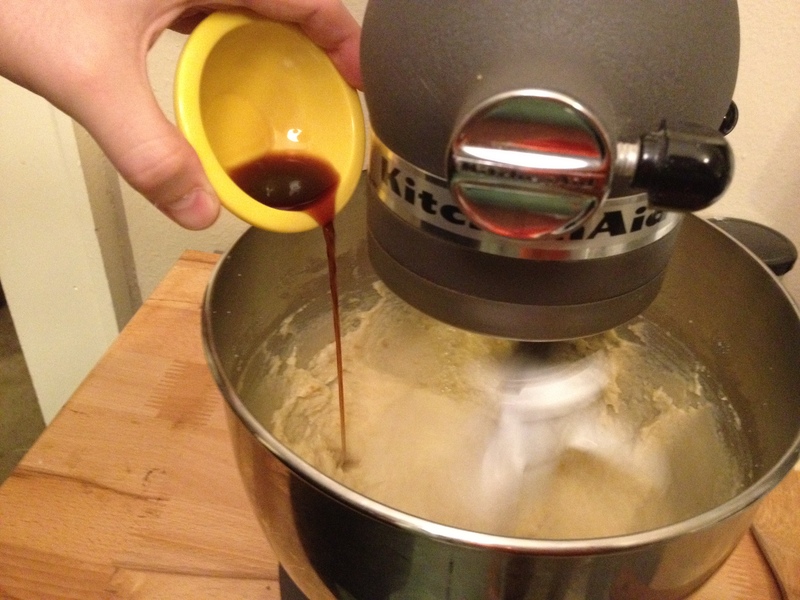 I used my scoop because it looked about the size of a tablespoon. They came out looking a little small and round. 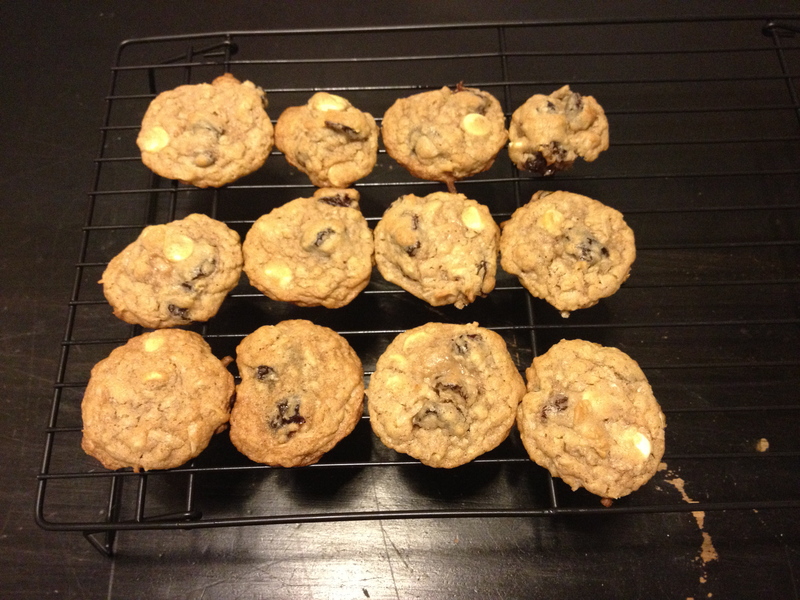 I pressed down on the next batch and they looked much better. 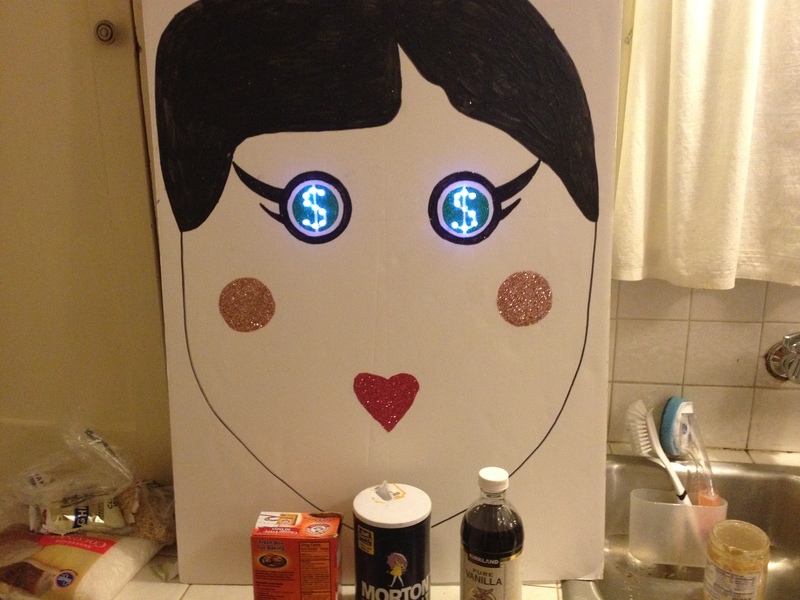 Step 14: Transform into the casino doll. Coconut has a lot of fat. 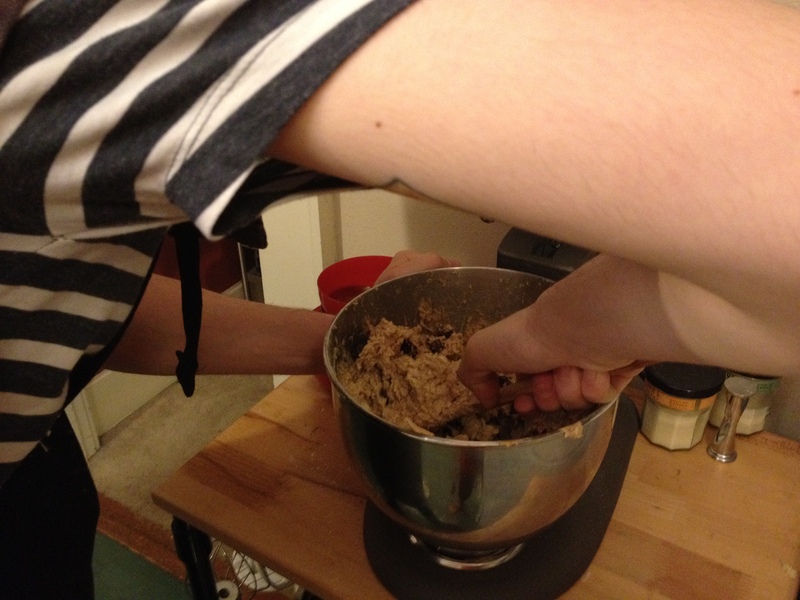 Stirring by hand is still difficult. Is coconut fat the “good fat”? When’s my next Vegas vacation? These were pretty popular at the potluck. I’m going to go buy some Scratch-Its now. These were soooooo good! The only reason I stopped eating them was because we ran out. 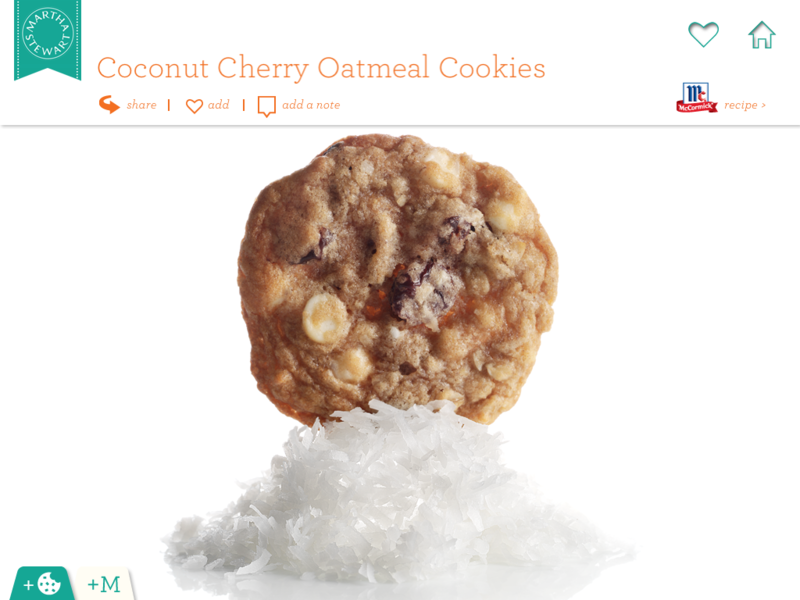 Well, cherries and coconuts are definitely fruits… sugar probably isn’t :D. These look great! Considering I had no time to eat any food yesterday except one (ok, two) of these cookies, I found them not only delicious by also sustaining. I LITERALLY would have died without them. These were so yummy! 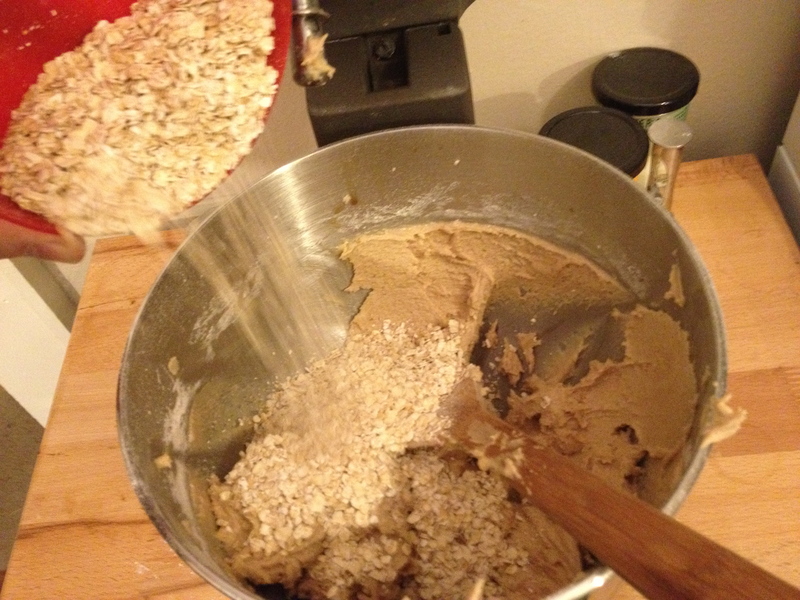 I don’t think coconut fat is the “good fat”… but it’s delicious so let’s not worry about that and eat lots of coconut! 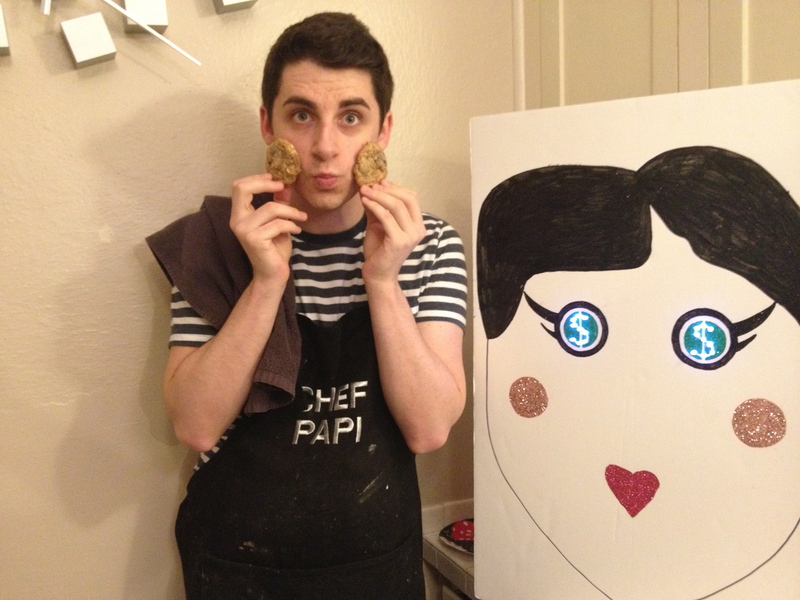 Loved these cookies! 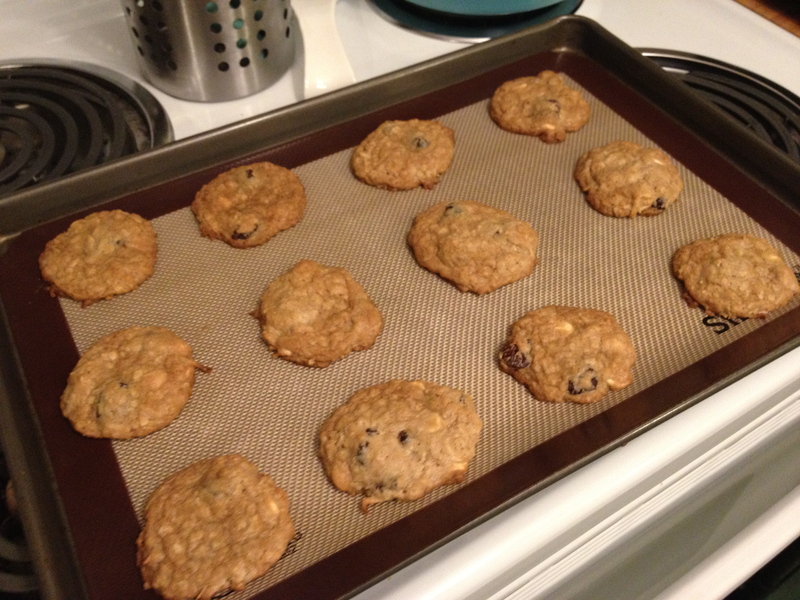 I’m a sucker for any cookies with oatmeal and the cherries really added a chewy sweetness.